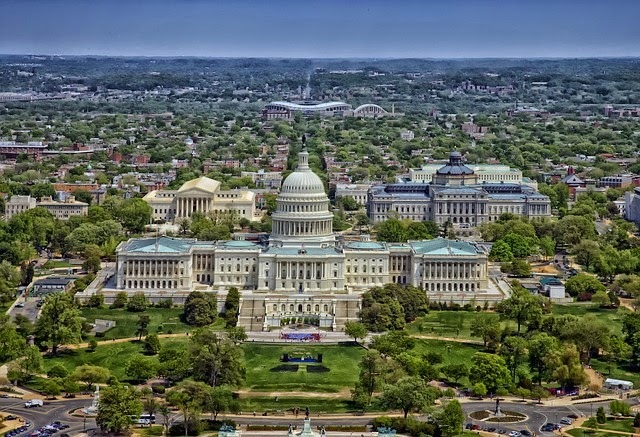 Washington DC has been the capital city of the United States since it was founded over 200 years ago. This city is where the politicians are--the President, the Senators and the Representatives. Since this is where the politicians are, this is where the federal money is as well. Federal money, federal jobs, federal agencies, everything federal, you can find it here. The problem is that too much of the nation's money accumulates around Washington DC, to the detriment of the other parts of the country. The result is massive waste--overpaid federal workers who do little work and are mediocre if not incompetent at their jobs. Bloated agencies finding absurd ways to throw away money that doesn't belong to them. Laughable multi-million-dollar projects are often highlighted in the news media. My proposal is to rotate the location of the US capital city every several years among all 50 states. Keep it in a state for, say, 5 years. But it would take 250 years to give every state its chance. But packing the government's bags every 1 or 2 years seems burdensome. Something like members of Congress who must campaign every 2 years to keep their jobs. Here local workers for the federal government when it travels to each state. Make it something like public service, similar to military service but as federal workers. With this proposal, it's easier to imagine the nation's money would be distributed more fairly among all states. Because remember, wherever the politicians are, the nation's money follows. This proposal would necessitate many more American becoming intimately involved in the government's work. People in South Dakota, say, when the capital arrives there, would thereby learn much more about what goes on in the federal government than they do today. Same for Oregon and Florida. And voters would vote with more information and knowledge than they do today. It would be a source of pride whenever the capital moved to a particular state, and all residents would surely want their tenure as the capital to be memorable in a positive manner. They would work harder and with a sense of patriotism because they know they will be judged against the accomplishments of the other states. As things stand today in DC, few citizens across the nation think of the federal government's tenure there as something positive, do they? The average person in the street when asked about Washington DC or the machinations of its politicians would react negatively. A rotating capital city would keep the nation on its toes, and would prove to be a more difficult target for our enemies. The next state chosen to be the capital would be determined at the last possible moment. At any rate, Washington DC needs a good shake-up. The politicians more so than the city itself. A rotating capital city might be just the thing to improve the government for centuries to come.